“Universities have abandoned their previous commitment to educating future citizens. 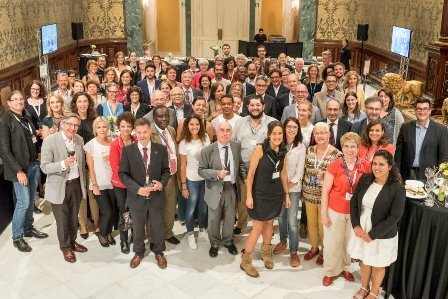 In this world where globalisation of indifference is growing, universities must prepare their students as citizens who practice and value freedom, equality and solidarity,” said Dr Frederico Mayor, former Director-General of UNESCO, in Barcelona on September 19, 2017. 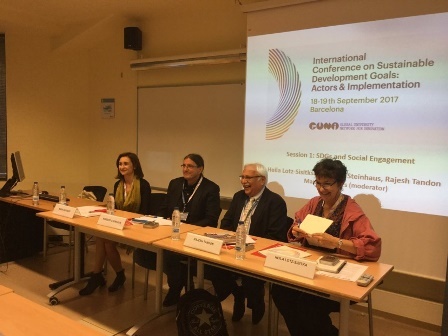 Dr Mayor was speaking at the closing session of the two day international conference on Sustainable Development Goals (SDGs) organised by Global University Network for Innovations (GUNi) in Barcelona. The conference brought together nearly 200 delegates from 21 countries to deliberate upon the roles that higher education can play in realisation of SDGs in different countries. Historically, universities in many countries have remained largely indifferent to international and national development efforts. In promoting engagement with society, universities have expanded their service mission, in which students are encouraged to contribute to development of communities. But core functions of teaching and research have remained cut off from such engagement. Engaged teaching and research can make universities contribute more directly to locally relevant and contextually appropriate SDGs. At the conference, Norbert Steinhaus of Living Knowledge Network in Europe described how science shops in many European countries are promoting partnerships between knowledge producing functions of universities with society. New research questions can emerge from such engagement. Bringing stakeholders together can generate sustainable solutions to local problems. Expanding on this issue, Heila Lotz-Sisitka of Rhodes University in South Africa described the partnerships focused on water issues in the region undertaken by her university. It has brought together practitioners, government officials, community leaders and academics to jointly study the growing problem of water shortage in their regions. The work of UNESCO Chair in Community Based Research and Social Responsibility in Higher Education (UNESCO Chair in CBRSR) is focused on promoting such engagements in the core functions of teaching and research in universities. Highlighting this theme, Dr Rajesh Tandon, Co-Chair, presented a paper entitled “Making the Commitment: Contributions of Higher Education to SDGs”. It demonstrated how different SDGs can be studied and acted upon by different faculties and departments of a university. The most important first step is widespread sharing of information about the 17 SDGs amongst students and faculty alike. There is at present a major gap in understanding what these SDGs are, how did they come about, and what challenges their achievement is likely to face. Additionally, different courses in various faculties can include SDGs in existing curriculum; new courses can also be designed to enable students to learn about and go deeper into the analysis of SDGs. Students can be prepared to contribute to achieving SDGs when they start their careers as professionals. Since 2030 is the agreed time frame for achieving SDGs, the present generation of young people in higher education institutions will be the social, economic and political leaders of the future who can commit to achieving SDGs. In this sense, students can begin to think more as global citizens if they engage with SDGs during their studies itself. Achievement of SDGs will also require finding new solutions to these socio-economic challenges. New knowledge will be essential towards this end. Universities can undertake partnerships with local communities and stakeholders to co-create such knowledge which is appropriate to local contexts and decision-makers. Co-creation of such knowledge is pre-requisite to finding sustainable solutions. European Union’s Science & Society programme under Horizon 2020 has been promoting Responsible Research & Innovation (RRI) in European universities. Public engagement with societal actors is a defining feature of this RRI approach. The UNESCO Chair in CBRSR has launched the Knowledge for Change (K4C) global consortium to build capacity of next generation of students to undertake community-based participatory research on issues of SDGs, as locally appropriate. It is designed to build such capacity in universities to partner with local communities and governments to produce actionable knowledge and solutions to SDGs in Uganda, South Africa, Brasil, Sardenia, India, Indonesia and Canada. 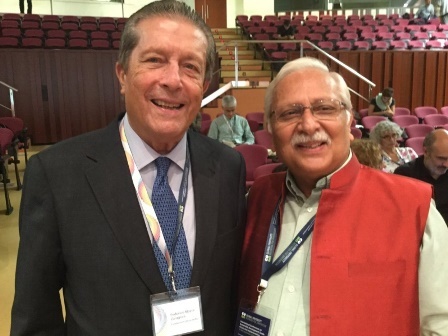 Deliberations in the GUNi conference last month also highlighted the critical constraints that universities and higher education systems face world-wide. First, global pressure for international ranking is pushing universities in many ‘southern’ contexts to undertake research which is published in peer-reviewed journals of global ranking, as opposed to contributing new knowledge that is actionable in local contexts. This dilemma and its dynamics has been adequately analysed in the 6th GUNi World Report on Higher Education, “Towards a Socially Responsible University: Balancing the Global with the Local”. The second major constraint is the rigidity of disciplinary silos. All 17 SDGs require multiple disciplinary perspectives to analyse local realities in order to produce sustainable solutions. Despite slogans of inter-disciplinarity, multi-disciplinarity, trans-disciplinarity, etc for the past several decades, much of the teaching and research in higher education remains discipline-bound, and bringing fresh ways of organising curriculum and learning pedagogies take long administrative processes before meaningful changes may be implemented. By then, humanity may have run out of time in achieving these 17 universal SDGs for all societies and peoples of the world.